The first California state cross country meet took place on Saturday, November 28, 1987. Since then, some of the state's brightest and most successful cross country coaches have amassed multiple team and individual championships. Of course, the roots of cross country in California go back FAR before there was a state meet, and this state was a breeding ground for legendary coaches in the "pre-state meet" time period. Some of the Golden State's best have bridged between the two eras, starting before the state meet came into being and continue to coach to this day. Every week through the end of cross country, we will feature one of these Coaching Legends, a past or present figure that helped shape the sport in the Golden State and make California the best state in the nation for cross country! Rene Paragas started running in junior high school PE. H wanted to break 5:00 in the mile and eventually got down to 5:11. In 1994, he graduated from Hart HS in Santa Clarita with a best of 1:55 for 800m. He went on to El Camino CC where he made the state meet two years in the 1500m with a best of 3:55, before finally earning a degree at Cal Poly Pomona. In his early days of running, he wanted to have good XC teams and used to try to convince his friends to run, organize Saturday workouts, design training programs for himself. That's where he first had the desire to coach. As he got older, he realized that teaching would be the best profession for him and with his degree in history, he also wanted to coach at the high school level. His mentors include his own coaches, Thom Lacie, Dave Klinger, Gene Blankenship and Dean Lofgren. He is also a big fan of coaches Jack Daniels and Arthur Lydiard. Paragas started coaching the Saugus boys in 2004 and took over the girls' program a year later. When he took over the boys program, they had finished in the bottom two at league for 4 straight years with only 13 boys on the team, and only one of them could break 5-minutes in the mile. He tried to get those kids to believe that they could compete with anyone. He tried to change everything so that they could break away from the past. The same was true for the girls when he started coaching them the next spring in track. He wiped the slate clean and tried to build from the ground up. Many of the girls did not like that approach and they faced some difficult challenges. 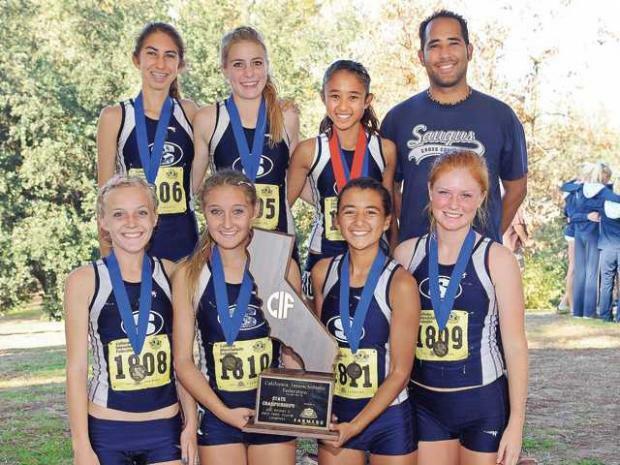 Fast forward to today and Saugus is now one of the premier Cross Country programs in California (2015 photo above at CA state meet). Their girls have won NINE state team titles (seven in a row from 2006 to 2012) which is one behind the state record held by San Francisco University HS. 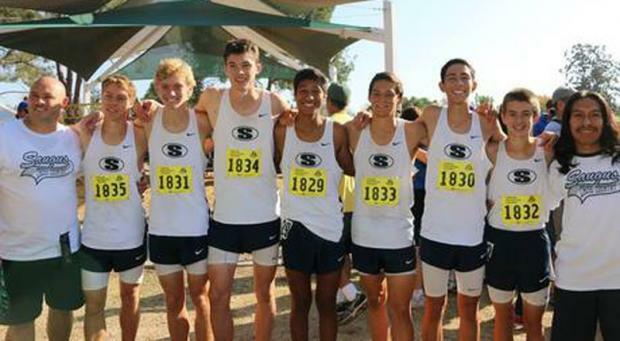 Saugus finished in second place in 2013 and 2015 and those may have been more remarkable than their state championships considering they finished 6th in the SS meet in 2013 and 7th in 2015, only advancing by the 6th man tie-breaker. Their 2007 and 2008 teams qualified for the Nike Team Nationals and finished in 2nd place behind perennial winner, Fayetteville-Manlius. In total, the Saugus girls have qualified for eight NTN/NXN meets with the two second place finishes above and a third place finish in 2010. Paragas has coached three individual state champions in Shannon Murakami in 2005, Kaylin Mahoney in 2008 and Brian Zabilski in 2014. His boys have podiumed four times at the state meet with seconds in 2010 and 2012, a team championship in 2013 and a 3rd place finish in 2014, all in Division II. AJ Yarnall qualified as an individual to NXN in 2012. 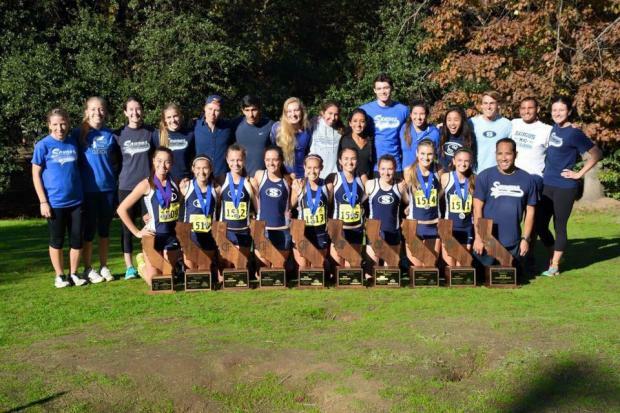 Last year, we asked cross country fans all over California to help us determine the best CA HS cross country program of all time and Saugus was voted as the #1 program. You can check out that article at this LINK. Fellow Saugus coach Micayla Frankian said this of Coach Paragas, "He has a way of knowing what each individual athlete needs at each moment to increase their fitness and speed. He's been a student of the sport for decades so that combined with his own athletic career and years coaching make him an expert in the sport. He sets the long-term goal for each season and can fill each step of training necessary to reach that goal. He's so successful because he knows how to pull the best out of each athlete and sees how athletics, academics, family life and extracurricular activities all work together." I have known Rene from the time he became the girls' head coach at Saugus High School in 2004. Our #1 girl was Anna Sperry and Saugus' #1 was Shannon Murakami. Anna and Shannon had many epic battles and they became long-time friends. Competing against Rene's teams is always challenging but his high level of success provides me with a measuring stick for the progress our Simi Valley's program. Over the years we have emulated many of the factors from Saugus' success to improve our teams. Rene has built success at Saugus through the utilization of a number of effective coaching strategies. He is a great evaluator and motivator of talent and he trains athletes in a scientific planned manner that allows for appropriate adjustments for both team and individual needs. Rene has great insight into athletes and his accessibility and genuine care for athletes makes them willing to perform at their best. He promotes a program that is team centered but coach driven. Saugus teams are fierce competitors and they are always ready to perform at their ultimate level when it counts. The accumulation of championships from league, CIF, and state is a testimonial to the preparedness of Saugus teams and individuals. And, significantly, Saugus athletes exhibit great sportsmanship! The best features regarding Rene is the man himself. Not only is he accessible, encouraging, respectful, and supportive of his athletes but these attributed are displayed as well to his colleagues in the coaching profession. Rene is willing to openly share his training plans, ideas, advice, and assistance to any and all coaches - making him a favorite presenter at LA 84 Coaching Clinics. Most endeavoring, though, is in spite of his success he remains friendly, honest, dignified and humble.